A scene from the occupation. 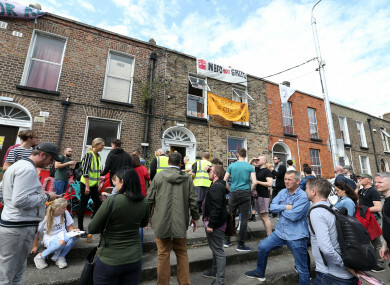 THE HIGH COURT has ordered that persons occupying a house in Dublin’s north inner city must vacate the property by 8am tomorrow morning. Justice Miriam O’Regan today granted the property owner PJ O Donnell (as trustee of the Pat O Donnell & Co Ltd Retirement and Death Benefit Plan) injunctions requiring persons unknown to vacate and cease trespassing at one of seven properties owned by the pension plan. However, there has been some interference with the other properties, which have been vacant since May to allow fire safety works to be completed, and the owner was concerned that the other properties may be interfered with. Barrister Julia Lawlor Bl, instructed by solicitor Tony Reynolds for O’Donnell told the High Court while the occupation was some sort of publicity-seeking form of political protest O’Donnell had received an email from an anonymous sender which added to the urgency of the action. Counsel said the email was entitled “drop dead” and told O ‘Donnell that if he did not drop the case there would be “hell to pay for you, your business and your family”. O’Donnell, who holds the properties in trust for the members of the pension plan. The court heard there are 67 members of the benefit plan, including 18 pensioners, who are employees and former employees of Pat O Donnell & Company. At the High Court today, Justice O’Regan granted the owner various injunctions, which are to remain in place pending any full hearing of the action, compelling those in occupation to leave number 35. The Judge said that the properties must be vacated by 8am tomorrow morning, 17 August. The Judge also noted that an order granted yesterday requiring all the all those in occupation identify themselves to the High Court had not been complied with. The Judge also granted O’Donnell’s lawyers permission to return to court should any issue arise. O Donnell was also been informed that the properties insurance will be cancelled if the occupation continued. Email “High Court orders occupiers of house in Dublin's north inner city to vacate by 8am tomorrow”. Feedback on “High Court orders occupiers of house in Dublin's north inner city to vacate by 8am tomorrow”.